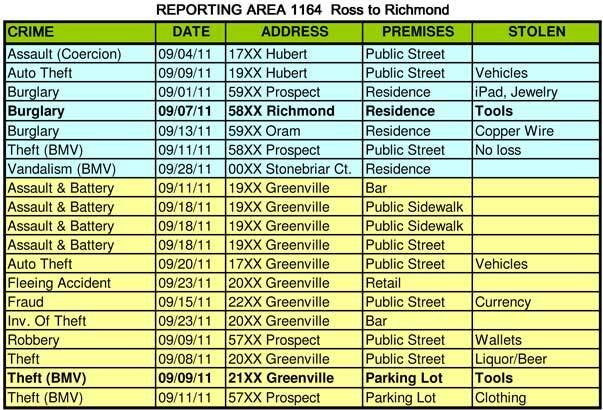 The Crime Reports for September 2011 are below. Although from the big picture, it looks like everything was about average this month, we do have a burglary issue hitting the area. I also wanted to thank all of you who came out to this year’s National Night Out earlier in the month. We estimate over 1000 neighbors came out for the event. From the data below, you can see there were 5 burglaries in the area between Marquita and McCommas, and Matilda and Skillman. (This area rarely sees burglaries.) These are part of a trend that is happening outside our neighborhood as well, both in Wilshire Heights and in the M-Streets to the east of us. Each time, there will be a cluster of several burglaries in one area. The thieves are breaking in through the back door and seem to be focussed on stealing Apple products such as iPads, Mac laptops and iPods. There are similar incidents happening in other parts of the neighborhood, but there have been clusters in this area that definately seem related. Initially these incidents were occurring in the early evening hours, but more recent events have occurred in the daytime. Police are watching reports daily for new incidents and deploying resources as needed to try to catch them. As a result, there were 3 arrests for theft or burglary this month, but these were not part of the trend. Now that our trash collection has moved to the front, many of us no longer check our alleys. I’ve noticed that the number of calls I get reporting suspicious behaviour in the alleys has increased since then. Also, since most of the incidents mentioned above occurred through a rear entry, they most likely entered from the alley. Our ENP officer has even driven through the alleys in the area to identify possible hiding spaces where bad guys could hang out to watch for residents coming and going. It might be a good time to check your alley to see if you can help. Here’s a few things you can do: Make sure its clear and free from overgrowth. Check to see if there are any hiding spots available near outbuildings. You can easily eliminate those with a small peice of fencing. Post your address numbers on the rear of your fence. (It helps officers find and report locations when in pursuit.) Most importantly, make sure your gate is secured. As part of getting increased patrols in the area due to the burglary trend, it looks like there are increased traffic patrols in the area as well. The most common citations are parking in the wrong direction and parking to block the sidewalk. One very unfortunate resident got 3 tickets in 2 days. If you park on the street, you must park in the direction of traffic flow. I hate seeing people get ticketed, but I won’t complain about having extra officers in the neighborhood.